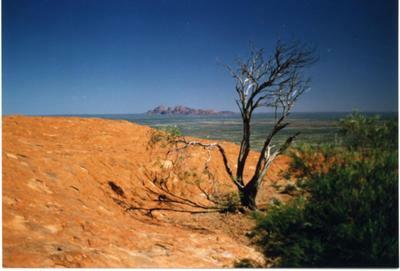 Vegetation atop Uluru, with Kata Tjuta in the background. I first visited Uluru with my parents back in the early 80's, and did "the climb." Back then we knew only that the rock had cultural significance to the local people but nobody told anyone that climbing it was against their wishes. There must have been hundreds of people climbing that day - the weather was glorious and the chain was a mass of various coloured shirts going up and coming down. There was quite a crowd at the marker cairn at the very top, and of course we all signed the visitors book that was kept up there. I was fascinated to see vegetation atop the rock - while it looks totally barren from ground level, some hardy plants have managed to take root in areas where water pools after the occasional rains. I stepped away from the crowd to find a quiet place for photography, and this was what I consider to be my best shot from that day. I returned with my wife in 2007, but these days with knowledge of the Anangu people's wishes I'm happy just to capture the views from ground level. Great photo, Jon! Thanks for sharing. Return to Uluru Trip Reports (Archive).